John Wikström EBM, Industrial The first time I heard of The Pain Machinery was the same day I saw them live beating up some oil drums and playing really heavy music. It sounded good then and it still does. This is not a new record, it's been in the stores for over two years now, but it is new to me. 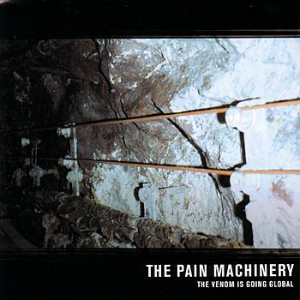 The Pain Machinery sounds a bit like Dulce Liquido, but more dirty and brutal. I think this music is interesting because it's complex but still simple. There are good melodies that make the music easy to listen to despite the aggressive sound. Many songs on this record are made for heavy dance floors. Only much smoke and a strobe give the music justice. "Blizzard", "Inside" and "One" are tracks worth some extra attention because they got the most power behind them. The first time I heard of The Pain Machinery was the same day I saw them live beating up some oil drums and playing really heavy music. It sounded good then and it still does. This is not a new record, it's been in the stores for over two years now, but it is new to me.